The best way we can explain it is through a basketball analogy. And then there’s super teams – ones comprised of players who came together by sheer accident and each went on to greatness (see the 2012 Oklahoma City Thunder, three of whom have now won consecutive league MVPs). Monsters of Folk are more reflective of LeBron and company; The Yardbirds had the Durant, Westbrook and Hardin of rock and roll, if you will. It’s the latter that Robert will be exploring this week with his selection for Vinally Friday. Formed in London in 1963, the band is most celebrated for starting the careers of Eric Clapton, Jimmy Page and Jeff Beck, three of the top five guitarists named by Rolling Stone as the greatest of all time. 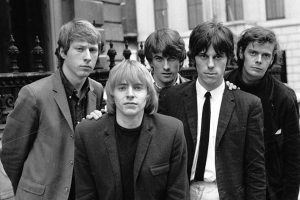 Clapton’s tenure with the Yardbirds, however, was short-lived. After scoring their first major hit, “For Your Love”, the blues devotee departed. Too pop, too radio-friendly, he said. Beck was his replacement. This week, Robert explores the short window of the Clapton/Beck transition with a few spins of the band’s first US album, aptly titled For Your Love. Released in 1965, the compilation was scheduled ahead of the band’s first American tour. Though eight of its 11 tracks were recorded before Clapton’s departure, the legend is not featured on the album cover. Though Beck and Page, too, are now long-gone from the band, you might be interested to learn that 55 years into their career they’re still going strong. In fact, the band just rocked Park City, Utah, for three straight nights late last month. 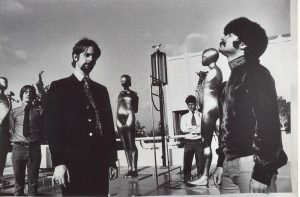 • Byrds‘ frontman Roger McGuinn will turn 76 years old on Friday, and Craig will celebrate – not with cake, nor by candlelight, but with a few of his favorite McGuinn-penned tracks from the band’s 1967 “greatest hits” compilation. • Alanya will get us hyped for one of the most anticipated concerts of the month with music from Trampled by Turtles’ seventh studio release, Wild Animals. • And we featured their newest single during New Tracks on the Trail last week – now Tommy will introduce us to a few other tracks from The Aces‘ full-length debut, When My Heart Felt Volcanic.